This Finnish e-Bike Looks Straight Out Of Tron And Packs Tesla-like Power! Comes with a hubless rear wheel with integrated rim motor. Generates an insane 320Nm of torque! Range varies from 200km to 300km based on the battery configuration. 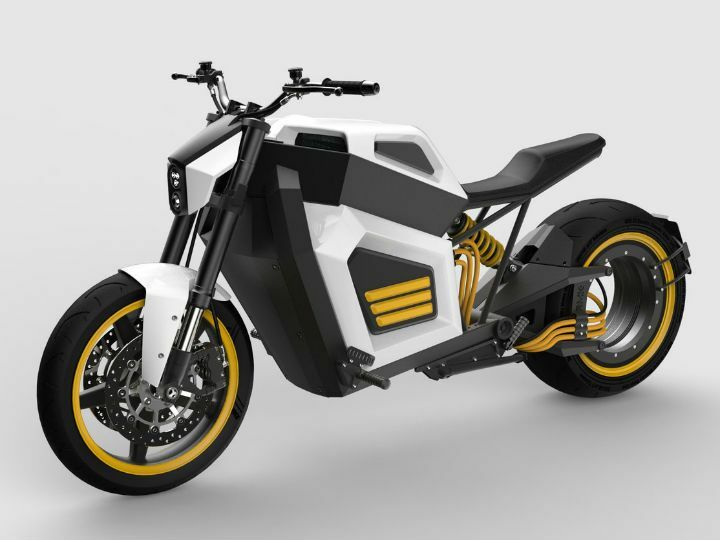 RMK Vehicle Corporation, a Finnish electric bike startup, has showcased its first product, the E2, at this year’s MP 19 Motorcycle Show in Helsinki, Finland. The E2 gets a roadster-like riding stance thanks to the tall and wide handlebar. But the position of the footpegs is laidback and is more cruiser-ish. For a clutter-free riding experience, the headlamp is placed low, while the customisable all-digital instrument console is mounted on the tank rather than the handlebar clamp. The instrument cluster also packs directional navigation. However, we’re not sure if it’s a good idea to break your line of sight for directions. Another noteworthy feature of the E2 is the over-the-air update feature that helps optimise the motorcycle’s system continuously. But the real party trick is at the rear! For starters, the E2 gets the brand’s proprietary rim motor integrated with a hubless rear wheel wrapped with a fat 240-section tyre. This not only looks straight out of a Tron movie, but the motor also offers enough grunt to give other performance-based electric motorcycles a run for their money. The rim motor makes a mind-boggling 320Nm of torque and 67.9PS of power! What’s more, all that tarmac-twisting torque comes right from the word go and is sustained all the way up to its limited top speed of 160kmph! This should translate to proper drag-spec acceleration! That explains the long 1600mm wheelbase. Interestingly, the motor is versatile enough to act as a brake, and it gets regenerative braking as well. There’s no clutch, no drive chain, no gears, no filter - just pure, brutal twist-and-go acceleration! For the sake of practicality, the hubless wheel is designed to facilitate tyre removal using conventional tools. RMK says the battery can be configured based on the customer’s needs to provide between 200km to 300km range. It can also be charged from zero to 80 per cent in just about 2 hours using the onboard charger. The frame looks like a hybrid between a perimeter and twin downtube setup. This unique design ensures optimal positioning of the large battery pack and keeps the total weight of the bike to about 200kg. Up front, the E2 comes with inverted forks and braking is done via twin discs with radial calipers. With such a fine balance of blistering performance and practical range, the motorcycle’s target price stands at a hefty 24,990 Euros (approx. Rs 20.3 lakh). Interestingly, the Harley-Davidson Livewire is also priced in the same ballpark (Rs 20.80 lakh) but offers only 177km range! RMK plans to commence small-scale manufacturing during fall 2019, followed by deliveries. Large-scale manufacturing will begin after the European Union type approval is complete. A commendable configuration but pricing is very high. A commendable configuration but pricing is very high.